To Cite: Taheri B, Barati A, Norasteh A A, Madadi-Shad M. EMG Analysis of Trunk and Lower Limb Muscles in Three Different Squat Exercises in Athletes and Non-Athletes, Int J Sport Stud Hlth. 2018 ; 1(2):e79463. doi: 10.5812/intjssh.79463. Objectives: Squat is known as a common and functional exercise for strengthening the lower limb muscles. However, researchers put it in the category of exercises with high risk of injury. So, the purpose of this study was to investigate the effect of three different techniques of squat on electromyographic response of trunk and lower limb muscles in athletes and non-athletes. Methods: Twenty subjects including 10 amateurs and 10 professional athletes ranging from 22 to 27 years old participated in the study. Three different techniques of squat were analyzed using electromyography (EMG) assessment. EMG was recorded from vastus lateralis, vastus medialis, semitendinosus, biceps femoris, adductor longus, transversus abdominis and multifidus muscles during squatting. Independent-Samples t-test and multivariate analysis of variance (MANOVA) were used to analysis the data. Results: The finding indicated that there was no significant difference between the two groups in all of the muscles activities (P ≤ 0.05). During lunge squat, the semitendinosus had more muscle activity in comparison with two other techniques (P = 0.023). However, the transversus abdominis and multifidus muscles revealed a less significant muscle activity during lunge squat (P = 0.001). Conclusions: Given the results of this study indicating that lunge squat is more suitable for strengthening the semitendinosus muscle and the parallel and plie squat technique seem to be better suited to strengthen the transversus abdominis and multifidus muscles, it can be argued that these movements can be used to strengthen the hamstring and spinal muscles respectively. Squat is one of the most popular exercises used by athletes during resistance training to strengthen lower limb muscles (1). Physicians and sports practitioners use squat movement during rehabilitation to train and empower leg muscles (2). It is believed that exercises such as squat that move in the closed kinetic chain (the movements that distal extremity is fixed on the ground) are more effective in improving the strength of the knee muscles (3, 4). In this regard, Giminiyani et al reported that closed-chain movements, reduce the risk of injury and lead to joint stability due to increased contraction around the joint (3). The closed-chain movement exercises are more attractive to coaches and therapists than open-chain motor exercises because of their high resemblance to daily activities, activation of more muscle fibers, reduced pressure on the ligaments and reduced scissors force on the joints (5). Athletes and patients in rehabilitation classes use different exercises and methods such as squat to strengthen lower limb muscles. Several studies have demonstrated the advantage of squat’s movement for knee rehabilitation after injury (6, 7). Factors such as the level of sitting (knee and thigh flexion), the position of the legs (standing width), the angles of legs, and the way the barbell is placed on the back, can create a variety of different ways to perform squat movements (8). The various types of squat’s movement include Parallel, Plie and Lunge squat. Vitoro et al. argued that performing Lunge squat movement, due to the recruitment for a large number of movement fibrils, is an appropriate exercise to strengthen the muscles of professional athletes (9). Fliming et al. reported that lunge squat movement had a great deal of pressure on the knee surfaces and it was a serious cause of injury (10). Although there are different ways to perform Squat’s movement (Parallel, Plie and Lunge squat), selecting a type of squat to further strengthen a specific muscle is a key concern of athletes and rehabilitation specialists. There are also many questions for athletes and coaches in this subject such as: Which squat movement is recommended for beginners? What types of movements are recommended for professionals? What kind of squat movement is less risky and can be used during rehabilitation? In spite of a variety of previous studies that have been conducted to assess neuromuscular activity of athletes and non-athletes during squat, no research was found regarding the study of electromyography activities of lower limbs in squat movement n connection with diffident levels of physical fitness. Therefore, the aim of this study was to evaluate the response of selected trunk and lower limb muscles in athletes and non-athletes when performing squat movements in three ways: Parallel, Plie and Lunge squat. The research hypothesis was based on the difference in muscle activity when performing various squat movements. It was also assumed that athletes have less muscular activity than not-athletes when performing squat. The population of this study included all male athletes and non-athletes from Guilan University ages ranging from 22 to 27 years old. Of these, 10 athletes whose lower limb were active in sports activities (running and football) for at least 3 years, 3 sessions a week and 10 non-athletes who had no regular excercise in the last 3 years, were selected based on convenience sampling method. Inclusion criteria were physical and mental health. Subjects were excluded if they had pain in one of the organs, history of surgery, fracture in the lower limbs, and also history of neuro-musculoskeletal disorders. The subjects were advised to have no intensive training within the two days prior to the tests and to avoid taking any food or medicine supplement. Before the test, the procedure of study was explained to the subjects. They were asked to fill out a sport-medical questionnaire, personal information and consent form. In order to record the electromyography variables, the Muscle Tester ME 3000, made in Finland, was used. Sixteen bipolar surface electrodes with 20 mm center to center distance were used. At the points of the body where the electrode was to be laid, the hair was shaved to reduce the skin’s resistance (11). Then the skin was cleaned with alcohol and cotton for setting electrodes. Reference electrode was set on the scapular acromion. The intervened frequency was 2000 Hz. the signals between 10 and 500 Hz was used for frequency cut and the Notch filter was used to remove noises generated by urban electricity. The location and direction of the installation of electrodes were based on the SENAIM European protocol (12). After 10 minutes of exercise and stretching, one maximum repetition (1RM) was done to perform any of the three techniques; Parallel, Plie and Lunge squat. Then after 15 minutes of rest, while the activity of the muscles was recorded by an electromyographic device, the subjects were asked to have a weight of 60% 1RM parallel, plie and the lunge squat (Figure 1). Figure 1. Performing the squat movement; A, parallel; B, plie with the outboard paw; C, squat lunges (scissors). Between the implementation of each technique, ten minutes rest was considered for the subject in order to minimize the fatigue mediator variable (13). The order of the techniques was chosen randomly for each individual. During the procedure, the activity of vastus lateralis, vastus medialis, semitendinosus, biceps femoris, adductor longus, transversus abdominis and multifidus muscles were recorded for the superior leg of the subjects. In the data analysis level, the information that obtained from the moment a person stood from a 90-degree flexion position (upward phase), was considered as a phase of movement. Finally, the data of this range was evaluated by the Mega-Win software and computerized by means of an electromyographic device as RMS index. Using the MVIC (Maximum valentry isometric contraction) method, muscle activity was normalized for each individual (14). The normal distribution of data was proved using the Shapiro-wilk test for parametric tests. The variance errors of variables were investigated by Levene test. 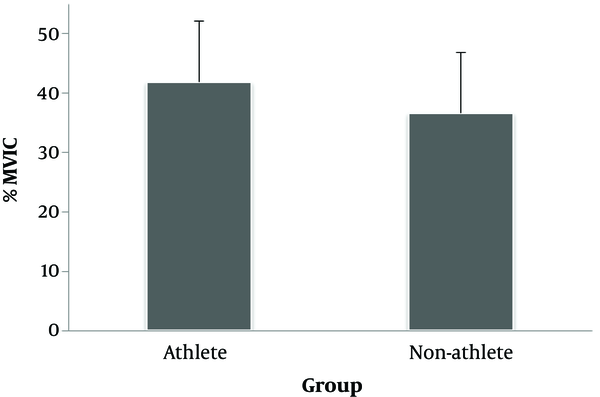 Independent-Samples t-test was used for comparison of athletes and non-athletes. The multivariate analysis of variance (MANOVA) was used to compare the activity of the lower limb and trunk muscles in the course of various squat exercises. The analysis was performed using SPSS software version 22. Significance level was P ≥ 0.05. Characteristics of the subjects is shown in Table 1. The results showed that the effect of the group factor on the level of electromyographic activity of all muscles was not statistically significant (P = 299, F = 1.143) (Figure 1). It was also found that the effect of type of movement on the total activity of electromyography of the muscles was not statistically significant (P = 0.637; F = 0.431) (Figures 2 and 3). As seen in Table 2, the activity of the semitendinosus muscle in the lunge movement was significantly higher than that of parallel (P = 0.023) and plie squat (P = 0.031), However, there was no significant difference between parallel and plie squat (P ≥ 0.05). The activity of transverse abdominal muscle was higher in parallel (P = 0.001) and plie squat (P ≥ 0.01) in comparison with lunge movement. Also, multifidus muscle activity was higher in parallel (P ≥ 0.01) and plie squat (P ≥ 0.01) compared to lunge squat. However, there was no significant difference in the activity of these two muscles at the time of parallel and plie squat (0.05 ppm). There was no statistically significant difference in the level of electromyographic activity of other muscles (biceps femoris, vastus lateralis vastus medialis, adductor longus, and gluteus medius) (P ≥ 0.05). aSignificant difference between the plie and lunge. bSignificant difference between the parallel and lunge. The results of this study showed that the activity of quadriceps muscles was not significantly different in squat movement with differentiated methods. The quadriceps muscles (including the muscles of vastus medialis, Rectus Femurios, vastus intermedius and vastus lateralis) as knee joint extensors, are the muscles that are present in most of the daily motor activity, especially in athletic skills with weight tolerance with continues pressure and fatigue (15-18). As a result, strengthening these muscles is very important. A number of previous researches have studied the extent of electromyographic activity of the muscles when performing squat movement in different positions of the legs (standing width) (1, 3). The results of this study showed that there is no significant difference in the level of activity of the quadriceps muscle in different positions of the legs during squat movement. In this regard, the results of this study were consistent with the mentioned research. Closed-chain movement exercises are used in rehabilitation more than movements of the open-chain because of much similarity with daily activities and the greater interaction of the muscles in the joints (especially in the knee joint due to lower tibia movement, lower pressure on the ligaments and a decrease in shear force on the joint) (10, 19). Since these three movements are considered to be part of the closed-chain practice, it is important to recognize their superiority on how to rehabilitate different patients. However, the results of this study showed that there is no statistically significant difference between the three movements in total muscle activity. 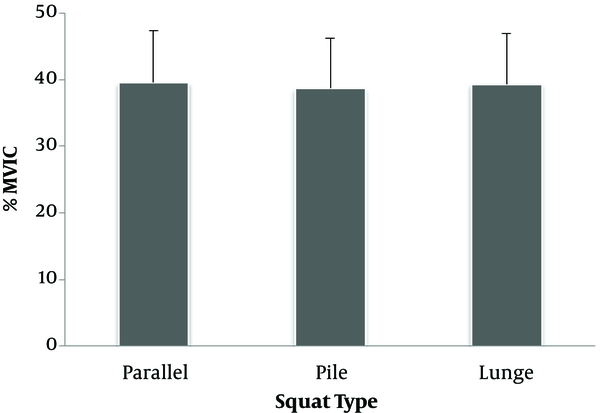 Comparison of muscle activity in the three squat methods during the considered phase showed that the muscle activity of semitendinosus in lunge squat was significantly higher than the two other movements. The ratio of hamstring muscle strength to quadriceps is one of the important indicators for predicting knee injuries, including damage to the anterior cruciate ligament (20). Therefore, since the semitendinosus is part of the hamstring muscle group, the increase in the activity of the hamstring muscle group in patients with anterior cruciate ligament injury is very important (21, 22). Consequently, the results of this study indicate that lunge squat is a better practice for the activation of quadriceps. Since the present study showed that lunge squat improves semitendinosus muscle more than the other two movements, this movement can be used as an appropriate practice therapy to prevent the complications. The results of this study showed that transversus abdominis muscle activity is higher in both parallel and plie squat moves compared to lunge squat. As the parallel and plie squat technique led to an increase in the activity of transversus abdominis muscle, it can be argued that the disk and the articular of the spine are less likely to be injured in these movements. Hides et al reported that the weakness of the multifidus muscle resulted in increased Lumbar arch and subsequently pain in the lumbar region (23). Because the results of the present study indicate more increase in the activity of multifidus muscle in parallel and plie squat than lunge squat, this type of squat training is recommended for people with weak spinal muscles to strengthen these muscles. Previous studies have shown that athletes with higher physical fitness have less muscle activity than non-athletic individuals (24-26). However, the results of this study showed that athletes and non-athletes have almost the same (non-significant) muscle activity when performing squat movement. Since the intensity of muscle activity was normalized by MVIC technique for each muscle itself, and squat was performed by 60% of the individual 1RM, it cannot be said that the subjects of two groups performed equal task. In this regard, the results of the pilot tests of the present study showed that athletes chose heavier weights for doing squat, which indicated that they were doing more tasks. The study limitations included: a) not using both male and female subjects b) low number of subjects C) although the first technique was the parallel squat, the subjects took distance of legs up to the width of the shoulders, when performing the technique. In fact, this was done to prevent the pressure on the Patella when going down to outward and preventing knee injury (27). Finally, it should be noted that the present study showed that lunge squat is more suitable for strengthening the semitendinosus muscle than the parallel and plie squat movement. Unlike lunge squat, parallel and plie movements seem to be better suited to strengthen the transversus abdominis and multifidus muscles. 1. Wong YM, Straub RK, Powers CM. The VMO:VL activation ratio while squatting with hip adduction is influenced by the choice of recording electrode. J Electromyogr Kinesiol. 2013;23(2):443-7. doi: 10.1016/j.jelekin.2012.10.003. [PubMed: 23141480]. 2. Giroux C, Guilhem G, Couturier A, Chollet D, Rabita G. Is muscle coordination affected by loading condition in ballistic movements? J Electromyogr Kinesiol. 2015;25(1):69-76. doi: 10.1016/j.jelekin.2014.10.014. [PubMed: 25467546]. 3. Di Giminiani R, Masedu F, Padulo J, Tihanyi J, Valenti M. The EMG activity-acceleration relationship to quantify the optimal vibration load when applying synchronous whole-body vibration. J Electromyogr Kinesiol. 2015;25(6):853-9. doi: 10.1016/j.jelekin.2015.09.004. [PubMed: 26443890]. 4. Laprade J, Culham E, Brouwer B. Comparison of five isometric exercises in the recruitment of the vastus medialis oblique in persons with and without patellofemoral pain syndrome. J Orthop Sports Phys Ther. 1998;27(3):197-204. doi: 10.2519/jospt.1998.27.3.197. [PubMed: 9513865]. 5. Hase K, Sako M, Ushiba J, Chino N. Motor strategies for initiating downward-oriented movements during standing in adults. Exp Brain Res. 2004;158(1):18-27. doi: 10.1007/s00221-004-1875-4. [PubMed: 15024541]. 6. Isear JJ, Erickson JC, Worrell TW. EMG analysis of lower extremity muscle recruitment patterns during an unloaded squat. Med Sci Sports Exerc. 1997;29(4):532-9. [PubMed: 9107637]. 7. McCaw ST, Melrose DR. Stance width and bar load effects on leg muscle activity during the parallel squat. Med Sci Sports Exerc. 1999;31(3):428-36. [PubMed: 10188748]. 8. Heijne A, Fleming BC, Renstrom PA, Peura GD, Beynnon BD, Werner S. Strain on the anterior cruciate ligament during closed kinetic chain exercises. Med Sci Sports Exerc. 2004;36(6):935-41. [PubMed: 15179161]. 9. Witvrouw E, Lysens R, Bellemans J, Peers K, Vanderstraeten G. Open versus closed kinetic chain exercises for patellofemoral pain. A prospective, randomized study. Am J Sports Med. 2000;28(5):687-94. [PubMed: 11032226]. 10. Fleming P, Spicer A. Working at a cynical distance: Implications for power, subjectivity and resistance. Organization. 2016;10(1):157-79. doi: 10.1177/1350508403010001376. 11. Farahpour N, Ghasemi S, Allard P, Saba MS. Electromyographic responses of erector spinae and lower limb's muscles to dynamic postural perturbations in patients with adolescent idiopathic scoliosis. J Electromyogr Kinesiol. 2014;24(5):645-51. doi: 10.1016/j.jelekin.2014.05.014. [PubMed: 25008019]. 12. Hermens HJ, Freriks B, Merletti R, Stegeman D, Blok J, Rau G, et al. European recommendations for surface electromyography. Roessingh Res Dev. 1999;8(2):13-54. 13. Stuempfle KJ, Katch FI, Petrie DF. Body composition relates poorly to performance tests in NCAA Division III football players. J Strength Cond Res. 2003;17(2):238-44. [PubMed: 12741858]. 14. Hermens HJ, Freriks B, Disselhorst-Klug C, Rau G. Development of recommendations for SEMG sensors and sensor placement procedures. J Electromyogr Kinesiol. 2000;10(5):361-74. [PubMed: 11018445]. 15. Karlsson S, Gerdle B. Mean frequency and signal amplitude of the surface EMG of the quadriceps muscles increase with increasing torque — a study using the continuous wavelet transform. J Electromyograph Kinesiol. 2001;11(2):131-40. doi: 10.1016/s1050-6411(00)00046-8. 16. Huber A, Suter E, Herzog W. Inhibition of the quadriceps muscles in elite male volleyball players. J Sports Sci. 1998;16(3):281-9. doi: 10.1080/026404198366812. [PubMed: 9596363]. 17. Bosco C, Colli R, Bonomi R, von Duvillard SP, Viru A. Monitoring strength training: neuromuscular and hormonal profile. Med Sci Sports Exerc. 2000;32(1):202-8. [PubMed: 10647550]. 18. Perumal R, Wexler AS, Ding J, Binder-Macleod SA. Modeling the length dependence of isometric force in human quadriceps muscles. J Biomechanics. 2002;35(7):919-30. doi: 10.1016/s0021-9290(02)00049-0. 19. Palmitier RA, An KN, Scott SG, Chao EY. Kinetic chain exercise in knee rehabilitation. Sports Med. 1991;11(6):402-13. [PubMed: 1925185]. 20. Brotzman SB, Manske RC. Clinical Orthopaedic Rehabilitation E-Book: An Evidence-Based Approach-Expert Consult. Elsevier Health Sciences; 2011. 21. Kopf S, Forsythe B, Wong AK, Tashman S, Anderst W, Irrgang JJ, et al. Nonanatomic tunnel position in traditional transtibial single-bundle anterior cruciate ligament reconstruction evaluated by three-dimensional computed tomography. J Bone Joint Surg Am. 2010;92(6):1427-31. doi: 10.2106/JBJS.I.00655. [PubMed: 20516318]. [PubMed Central: PMC2874668]. 22. Bailie G, Corry I. What is the optimal treatment of acute anterior cruciate ligament injury? Evid Base Sports Med. 2008:453. 23. Hides JA, Stokes MJ, Saide M, Jull GA, Cooper DH. Evidence of lumbar multifidus muscle wasting ipsilateral to symptoms in patients with acute/subacute low back pain. Spine (Phila Pa 1976). 1994;19(2):165-72. [PubMed: 8153825]. 24. Hurd WJ, Chmielewski TL, Snyder-Mackler L. Perturbation-enhanced neuromuscular training alters muscle activity in female athletes. Knee Surg Sports Traumatol Arthrosc. 2006;14(1):60-9. doi: 10.1007/s00167-005-0624-y. [PubMed: 15937713]. 25. Hinton-Bayre AD. Contemporary Classifications of Concussion Severity and Short Term Neuropsychological Outcome. Br J Sports Med. 2002;36(3):217. doi: 10.1136/bjsm.36.3.217. 26. Laughton CA, Slavin M, Katdare K, Nolan L, Bean JF, Kerrigan DC, et al. Aging, muscle activity, and balance control: physiologic changes associated with balance impairment. Gait Posture. 2003;18(2):101-8. [PubMed: 14654213]. 27. Lahti J. Effects of internal kinetics and muscle activity during the wide and narrow barbell back squat. 2017. Available from: https://jyx.jyu.fi/handle/123456789/54266.